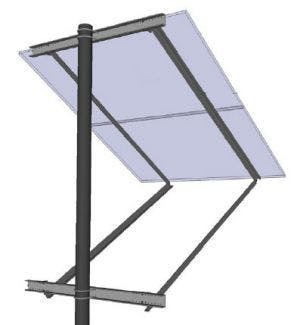 These mounts are available in several models to accomodate small PV arrays. The SOP mounts are built for use on 3” or 4” schedule 40 or 80 steel posts. Custom mounts can be ordered for a variety of other post sizes. The braces can either run in front of the panel or back behind which allows greater flexibility in choosing the site for the mount. The panel inclination is controlled through a range of 20° to 90° just by changing the attachment to the brace. All aluminum components of the mount are cut from 6061 T6 extrusions for superior rigidity. Panel rails feature T-slotted extrusion designed for easy and infinite adjustability of panel hardware placement and extra strength. Zinc plated U-Bolts are provided for standard attachment to 3” or 4” schedule 40 or 80 posts and stainless steel mounting hardware for all panel attachments and parts assembly are included. Optional attachment brackets for trees and power/phone poles can be purchased upon request. General Specialties mounts are manufactured in the USA and are built to last a lifetime. Please call us for help sizing a mount.